Is English DNA different from German DNA? A year ago I blogged about the paucity of identifiable German DNA in the current round of ethnicity estimates: Where Did All The German-Americans Come From? In that post I described the ethnicity reports of my wife who descends from 5 great-grandparents who have roots in what is today Northern Germany and Northwest Poland. The other 3 were from Ireland, Scotland and England. This past weekend I was struck with the similarity of the ethnicity estimates Debbie Kennett self reported and those predicted for my wife. The only problem is that all of Debbie's known ancestral lines appear to have been in the British Isles for at least the last few centuries and most of them have been in England. As I read Debbie's post, Comparing admixture results from AncestryDNA, 23andMe and Family Tree DNA, I speculated as to whether it would be obvious, to those shown the test reports for Debbie and those for my wife Denise, which woman had ancestry almost completely from the Isles and which had ancestry predominately from Germany/Prussia. I'll let you be the judge. 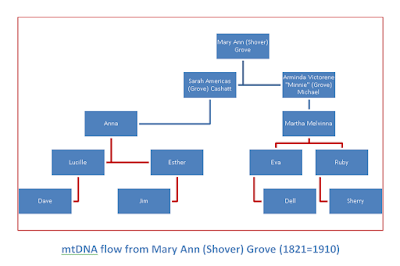 mtDNA doesn't change fast enough to be genealogically useful -- or does it? I just love the scientific method of family history research. I can make an educated guess as to what a family relationship may be. Then I can formulate a hypothesis that is a reasonable explanation for that guess. Next I can set this hypothesis up as a figurative piñata. I then take a figurative stick and try to beat that hypothesis into submission using every genealogical tool I can lay my hands on. If I fail, I invite my family members and other genealogical colleagues to take whacks at my piñata hypothesis. As long as none of us can break my hypothesis, I assume it is correct and move on to formulate additional hypotheses to test. Of course sometimes there are subsequent developments that rattle my old undisproven hypotheses. That's when I have the opportunity to learn something new. Learning something new is one of my favorite things. According to the conventional wisdom among genetic genealogists, mitochondrial (mtDNA) changes so slowly that it is not often genealogically useful in sorting out relationships. This was easy for me to believe when I went for years without getting an exact match. Then in my views began to change. In two cases it appeared that mtDNA provide important guidance even though in neither instance are they likely to lead to exact matches with ancestral relatives. These cases have been previously reported in this blog. One related to my paternal grandmother's mtDNA and the other my maternal grandmother's mtDNA. Yep, and it's a very close relationship: my own first cousin. This particular cousin is the younger of two daughters of my mother's youngest sister. Full sibling situation, no chance of any NPE of any kind, all the right autosomal indications. And this maternal first cousin of mine and I show as a genetic distance of two. It turns out that I have a heteroplasmy in HVR1, and Paula has one in the coding region. FTDNA reports that as a genetic distance of two. Interestingly, her mother doesn't have either of those heteroplasmies, so -- as Paula puts it -- we're both mutants! Wrote this up on the blog: Getting the drift. In my case a Sherry, 3rd cousin, and I discovered that we were listed by FTDNA as mismatches of THREE. Are we both mutants? We are still trying to work that one out. Sherry and I have each identified a first cousin to test to narrow our gap. In so doing we hope to be able to follow our mtDNA two generations back to our respective maternal grandmothers. This would be along the red lines shown connecting the individuals in the above diagram. After we get these test results back we will reassess and consider our next step(s). In our case we are fortunate that Sherry and I are exact matches in the coding region -- the largest part of our mitochondria. This means we can test additional cousins for a relatively reasonable cost. We only need to order HVR1 & HVR2 tests to help resolve our mutant markers. Of particular interest is that there were 21 reads at location 16519. The results were 5 "T"s and 16 "C"s. All 9 reads at location 152 found "C". To be continued as reports on cousins Jim and Dell come back from the lab in about a month. As they do will it cause me to have to re-examine my hypothesis about my one exact full mitochondrial match (see above)? Will I find that the actual mtDNA haplotype of my maternal 2nd great-grandmother really was not the same as mine? Stay tuned.